What is an Alumni Privilege Card? The Alumni Privilege Card is more than just an identification card. It carries with it certain perks and privileges. Alumni Privilege Cards are available for claiming a few weeks after graduation and shall be announced on UB’s Official Fan page on Facebook once available. The student’s ID must be surrendered at the Community Relations, Alumni & Placement Office in order to claim the Alumni Privilege Card. If the APC will be picked up by a person other than the graduate, an authorization letter and ID is required. How to Apply for an APC? 1. Fill out APC Application form at the CAPO Office. 2. Pay Application Fee at the Cashier’s Office. 3. Proceed to the Bookstore for pictorial. The Alumni Privilege Card is a fee-based and a fund-raising program offered by the Community Relations, Alumni and Placement Office of the University of Batangas . It does not merely serve as an identification of alumni but it provides cardholders certain benefits such as discounts, freebies and perks offered by participating merchant establishments within Batangas province. It also includes use of University’s facilities such as access to the UB Learning Resource Center, lifetime use of the UB Webmail, special rate discount to UB facilities rental fee and to the UB Canteen catering services, and invitations to many events. By purchasing this Card, submitting information and using this Card you agreed to be bound by this policy. Students who are graduates of any 2 year and 4 year courses in the University will automatically be entitled to an Alumni Privilege Card. Only one card is allowed per graduate. Graduates cannot apply for cards on behalf of other graduates except for valid reasons and upon written authorization of the graduate to the applicant. They must present their school ID upon claiming the Alumni Privilege Card to verify that they bear the same student number, course and year graduated. CAPO does not permit the sharing of the Card, student numbers or discounts with any other alumni. 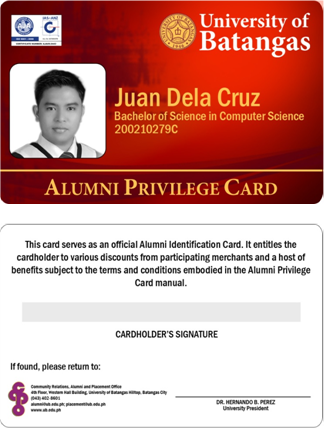 The Alumni Privilege Card is only for the exclusive use of the cardholder himself. If CAPO, believes that the Card is being used in any of these ways, it reserves its right to cancel Cardholder’s rights immediately. If you believe someone made an unauthorized use thereof, please contact CAPO at (043) 402-8601. In case the Alumni Privilege Card was not claimed on the scheduled dates of distribution. The graduate may claim the same on any dates thereafter, provided he/she will undergo clearance procedure. Your card is your lifetime identification as an alumnus / alumna of the University of Batangas . Carry your card at all times. NO ACTIVATION is needed to access complete savings, benefits and services. Once you receive the card, it’s ready for use. The Card is NON-TRANSFERABLE and may only be used by the person whose name is printed or whose photo appears on the Card. The card will bear your permanent student number (e.g. 200410737C) which will also serve as your lifetime alumni number. It will also serve as a pass without a need for securing Visitor’s Pass whenever an alumnus/ alumna will visit the UB campuses. How to use your card in stores or other merchant partners? You must present your card before making any purchase / order at any participating merchant partners. Failure to present the card would not entitle the holder any discounts, freebies and perks offered by the merchant. A merchant has the right to deny a discount if you do not present your card before payment. In case of any doubt as to the identity of the alumni by the merchant partner representative, the latter reserves the right to request for an additional Identification card such as school ID and the like to verify that you are a rightful Cardholder. The Card shall not be used as a form of payment. For each transaction you will make, you will be asked to sign on Information / Log sheet. For food chains and restaurants, discounts, freebies and perks would only be applied for food purchases made for personal consumption of the Cardholder himself. Freebies and perks of the store or restaurants are always subject to availability and may be limited especially during peak periods. Any use of the Alumni Privilege Card in a manner that violates the rules and regulations of the participating merchant partners is prohibited by this Agreement and is a ground for the cancellation or revocation of the Alumni Privilege Card. CAPO reserves the right to revoke Cardholder’s rights in the event of such violation. No refunds. In case of lost cards, the Alumni Office must be notified immediately. The Cardholder should apply for a replacement of the Card upon filling out the “ALUMNI PRIVILEGE CARD REPLACEMENT FORM” at the CAPO office. A replacement fee of Php 300.00 will be charged in case of a lost or stolen card. Any form of reproduction of copies of this Card is strictly prohibited. UB CAPO is not responsible if a sponsor changes its discount due to new ownership or acquisition of the merchant establishments. If you have a dispute with a sponsor merchant, UB CAPO will take commercially reasonable efforts to solve the dispute on your behalf. You may report disputes with sponsor merchants by contacting UB CAPO. Reports must be submitted in written form with the following information: merchant name, merchant address, date of purchase, discount denied and purchase information. Attach any proof of purchase (e.g. receipt). Any changes of offers and freebies granted by the merchant partners should be notified to the CAPO for cardholder’s advisory. Failure of the merchant partner’s notifications to the UB CAPO, will hold the merchant partner’s liable to provide the discount, freebies and perks indicated in the pamphlets. Any information submitted by the cardholder to the Alumni Office pertaining to all information contained in the Alumni Card will be treated with utmost confidentiality. University of Batangas Community Relations , Alumni and Placement Office and participating merchant partners are separate and independent entities. The CAPO is not liable for any products or services, provided by the merchant partners, beyond the satisfaction of the customers / cardholders. CAPO takes no part in the profit sharing of the establishments for the use of the Alumni Privilege Card. UB CAPO IS NOT LIABLE FOR ANY PRODUCTS OR SERVICES PROVIDED BY OR THROUGH ANY SPONSOR OF THE PRIVILEGE CARD, OR FOR ANY ERROR, OMISSION OR INACCURACY IN ADVERTISING MATERIAL OR FOR ANY LIABILITY RESULTING DIRECTLY OR INDIRECTLY FROM A PRODUCT OR SERVICE PROVIDED BY ANY SPONSOR OR OTHER THIRD PARTY IN CONNECTION WITH THE DISCOUNT PROGRAM.